I (Gene Johnson) made a trip to Somerset Ohio in October of 1984 to see if I could get information on the Heffley family. I visited the New Lexington Court House in Perry County, Ohio, and the Holy Trinity Church in Somerset, Ohio. The church cemetery is right behind the church. I think about half the grave markers I saw had the surname of Heffley. This is the origin of the Heffley family in America. It started with George Henry, age 22 of Switzerland, marring Lucy Gordon, age 19 of Pennsylvania. They were married in 1846, in Sumerset, Ohio. 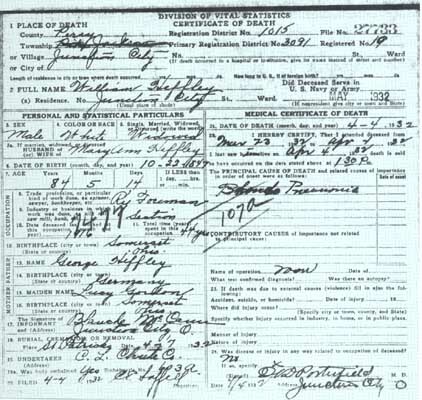 There is some confusion about where George Henry was born. 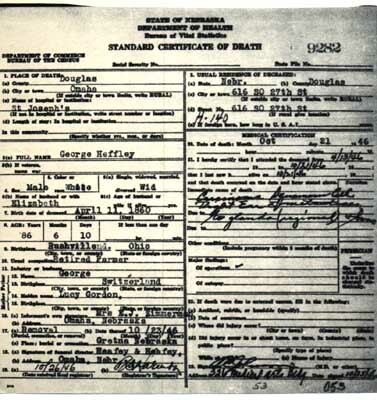 His death certificate says Germany, however, several of the children list their father as a native of Switzerland or Germany. I tend to think Switzerland because of the close family connection of the informants. 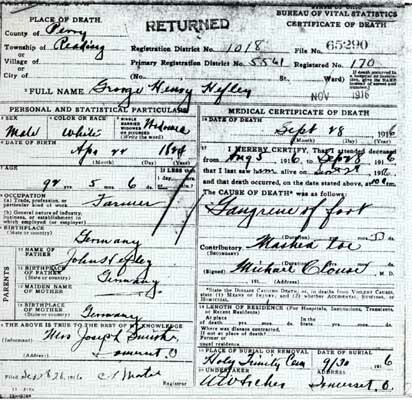 The question of where George Henry was born is not decided. 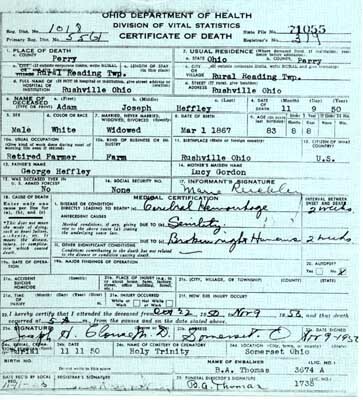 His death certificate says Germany with the informant being Mrs. Joseph Smith. 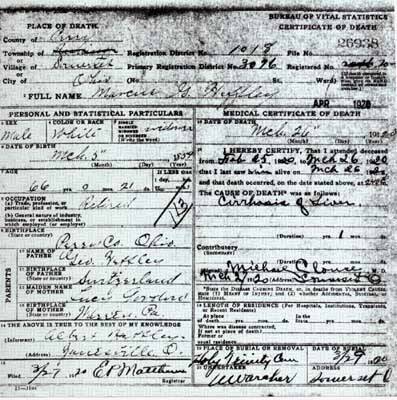 His son William's death certificate says Germany with the informant being Blanche McCasus. Sons Adam and Albert were informants on death certificates for two brothers and they say Stitzerland. Mrs. E.J. Zimmerman was the informatn for Geroge and she said Switzerland. Perry County is a very nice area and it is easy to see why the early settlers would want to call it home. William Gordon moved to Somerset from Pennsylvania and that is how Lucy arrived. See the Gordon web page for that information. I received the following information, on early Perry County, from Evelyn D. Wolfe, Corresponding Secretary of the Perry County Chapter, O.G.S. in January, 1985. It gives you a flavor of what the County would have been like when George Henry Heffley and Lucy Gordon first came to live there. The following are a few facts that I have jotted down and have in my own files: Perry County was organized on Dec. 26, 1817, No. 52 of the Ohio Counties. It was formed from parts of Washington, Muskingum and Fairfield counties. Early white settlers in Perry Co. found more than 100 mounds, fortifications, earthworks and village sites which attested to its prehistoric habitation by the Mound Builders. The first white man known to have been in the county was Christopher Gist, explorer for the Ohio Land Co. He wrote that he camped in 1751 near the shore of the "Big Swamp" (today's Buckeye Lake) near Thornport, In 1773, Lewis Wetzel and Simon Girty were known to be in the area from time to time with their Indian friends. In 1801, George Arnold had entered land in Reading Twp., which he sold soon afterwards to Christian Binckley. The first village was New Reading which was platted in 1805 by Peter Overmyer, Sr. and first called "Ober- meyersettle" or "Overmyertown". It took its permanent name from Reading, PA. the former home of many of its early inhabitants. Somerset was the first county seat, however, it was moved to New Lexington about 1857. The first, Lutheran Church in Ohio was formed in 1805 at New Reading (just west of Somerset). The first Roman Catholic Church in Ohio was formed just south of Somerset in 1818 and called St. Joseph's and the first convent in Ohio was erected in 1830 in Somerset and was called St. Mary's (Dominican). This convent was later moved to Columbus, Ohio and was called St. Mary's of the Springs and which now houses the Dominican College. General Phillip H. Sheridan, the military hero of the Civil War, was reared in Somerset. Today his statue is seen by thousands of travelers as they pass through Somerset on U.S. Rt. #22 between Zanesville and Lancaster, Ohio. The county is rich in shale, sandstone, coal, clay, limestone, oil and iron ore. Roughly half of the county is devoted to these resources and the industries; the other half is farming. There are rolling hills covered with trees and other vegetation is unexcelled anywhere in the nation. Many, many miles can be seen from several points in the county. A historic route, U.S. Rt. #22, follows somewhat closely the historic Zane's Trace, contracted for by Congress with Col. Ebenezer Zane of Wheeling, W. VA. in 1797, and laid out from Wheeling to Maysville, KY. by his brother Jonathan Zane and John Mclntire, Jonathan's brother-in-law. Zane's Trace became the great high- way of westward emigration, and was the connecting link between the east and the settlements in the southwest. J.A. MacGahan ("Liberator of Bulgaria"), writer, traveler, journalist and patriot, whose name will live while "liberty" is in the language, was born near Pigeon Roost, south of New Lexington, and posterity delights to honor his memory, not only at home but abroad. 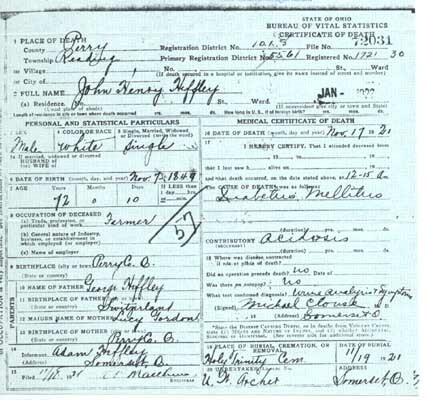 The picture below is the family of George Henry Heffley. He is the old gentelman sitting down. 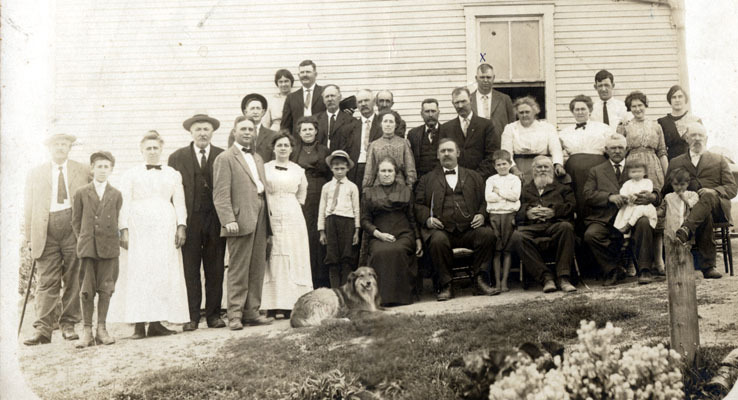 My great grandfather, George Heffley, is in the back row by the window with a small x mark above his head. there are many other Heffley brothers and sisters in this picture. The dog's name is Shep "grin". George, the father, 90 years, weight 210; William, 67, weight 212; John, 65, weight 240; Mark, 61, weight 242; Albert, 58, weight 315; James, 56, weight 210; George, 54, weight 222; Adam, 47, weight 200; Edward, 45, weight 210. The combined ages of the nine totals 543 years and the combined weight, 2049 pounds. James, George and Edward live in Nebraska and the others in this state. This Old Man Living in Perry County, Contracts it at the Age of Ninety-one. The following was printed it the January 12, 1888, publication of the Waterloo news, page 3. It was interesting what they considered news back then. George Heffley and his estimable young wife are looking after Mark Heffley's worldly possessions while he and Mrs. Heffley are visiting their parents in Ohio. The following appeared in the August 18, 1898, edition of the New Lexington Herald. 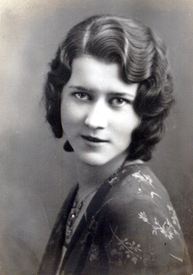 Mrs. William Heffley, of Junction City, and Miss. Lizzie Heffley, of Summerset, left on Monday for a visit to relatives in Omaha. They expect to remain about two months. 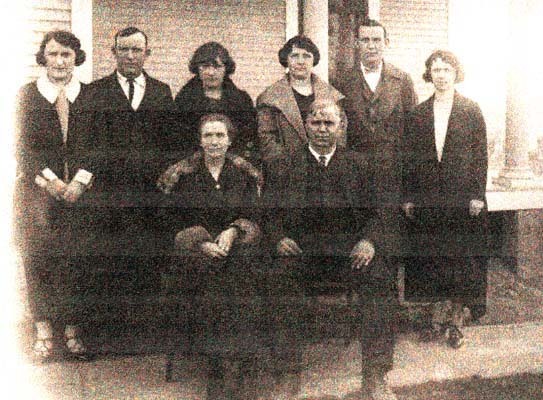 The picture below is the family of George Heffley. His wife, Elizabeth Gillespie, is sitting next to him. Adam LeRoy (Roy) is the first male standing from the left. The other male would be Gordon Heffley. The women left to right are Sara Ellen, Irene Mary, Margaret, and Gertrude. 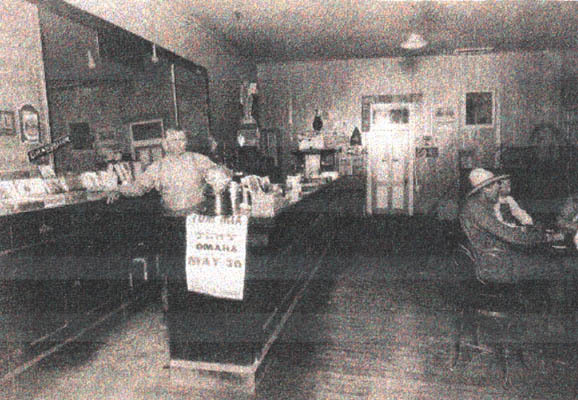 George Heffley had a bar located in Gretna, Nebraska. This is a picture looking inside. This is a picture of the Roy Heffly family. 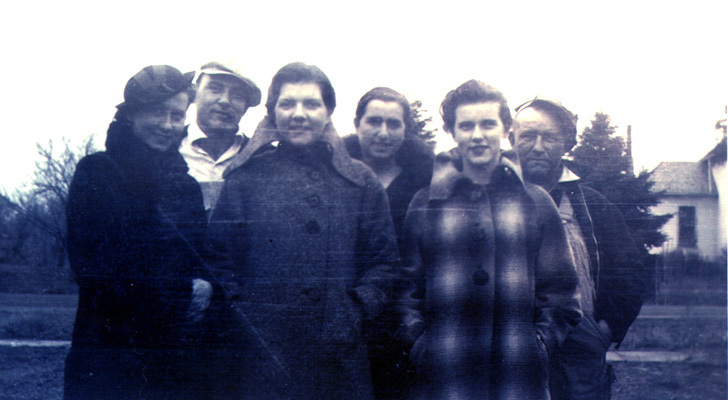 Left to right: Rowena, Delbert, Geraldine, Minnie, Phyllis, Roy. This is a picture of Rowena. This is a picture of a young Rowena in a school play. She is the third princess from the left. Looking at her expression I would say she was wishing she was some where else (grin). 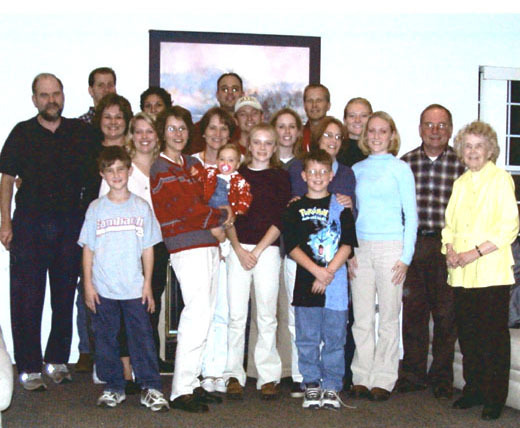 The picture below is a picture of a family reunion held in 2000 that includes the Delbert Heffley family along with the Gene Johnson family.